What does this say about the power of the Catholic Church in the Middle Ages? How many sections is the picture divided into? What place does this section depict? Why do you think so? Overall, what purpose would a picture or painting like this serve for the Catholic Church in Medieval Europe? Use the eduCanon video clip to fill in your notes about the power the Catholic Church had in Europe during the middle Ages. Follow the directions as you go. 1. What type of power it had. 2. Why it had this power. 3. How it was involved in the lives of medieval people. ​* Get this checked by me to make sure you have all the info before you move onto the next activity! ​There are 4 different stations activities located around my room that you need to complete! You will follow the directions at each station to complete the tasks and record any required information. ﻿* Get this checked by me ONCE YOU COMPLETE ALL STATIONS to make sure you have all the info before you move onto the next activity! Go to Edcite and complete the assignment about the Medieval Catholic Church. The Big Idea: Achievements in medicine, science, mathematics and geography by the Islamic civilization dominated most of the Mediterranean after the decline of the Roman Empire. These achievements were introduced into Western Europe as a result of the Muslim conquests, Crusades and trade, influencing the European Renaissance. I can define the Crusades and identify causes for them. I can explain how the achievements of the Islamic civilization were introduced to Western Europe. ​Directions: Follow the Tasks below in order to fill in your notes sheets about the Crusades. Task 1 - Read this Summary of the Crusades. Use it to fill in key term definitions. During the 1000’s the heart of Christianity and the Catholic Church was located in Rome, Italy. This was where the Pope and other high clergy officials lived. All of Western Europe was living under the Feudal System. At the same time, another great civilization, was having a Golden Age. The Arab Muslims had control of half of Spain, Northern Africa, the Middle East and part of Asia Minor (Modern day Turkey). These Muslims opened the Holy Lands (lands in the Middle East that are considered holy by Christianity, Judaism and Islam) and the city of Jerusalem (city in modern day Israel that is considered holy for Christianity, Judaism and Islam) for all monotheistic religions to come and pray: Muslims, Christians and Jews. This land bordered the Mediterranean Sea in the East. But in the early eleventh century, the Turks—who were also Muslim—took control of the Holy Lands, including Jerusalem. Rather than allowing religious freedom, they closed Jerusalem to both Jews and Christians. Also, the Turks started invading the Christian lands of the Byzantine Empire, which bordered the Holy Land. These two aggressive moves by the Turks started a chain reaction beginning with the Christian emperor of the Byzantines sending envoys to the Pope in Rome seeking help. In 1095, Pope Urban II received the Byzantine emperor’s plea asking armored knights to help open the Holy Land and defend against the Turks. 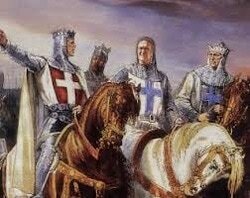 The Pope responded and asked the knights of Europe for a crusade (one of many religious military expeditions made by European Christians to try to take the Holy Land and Jerusalem from the Muslims between 1095 and 1291) or holy war against the Muslim forces in the Holy Land. As a result of this plea, several armies were formed and started the trek to the Holy Land. The symbol of the crusader became a red cross sewn on their tunics. 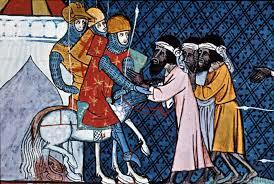 Not only knights went to the Holy Land, peasant men, women and families traveled there as well. 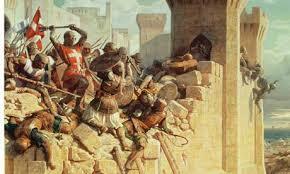 Winning the Holy Land for Christianity was one of the MANY causes of the Crusades. Task 3 - Use the 4 primary sources below to determine 4 reasons people in Western Europe were willing to go on Crusades. Read each source and then sum it up in your own words and add it to the appropriate box on your notes sheet. YOU ARE NOT COPYING THE SOURCE - you are simply summing up the main idea in a sentence or two. Your brethren (other Christians) who live in the east are in urgent need of your help and you must hasten (hurry) to give them the aid which has often been promised them. For, as most of you have heard, the Turks and Arabs have attacked them…They have killed and captured many, and have destroyed the churches…If you permit them to continue…the faithful of God will be much more widely attacked by them. On this account I, or rather the Lord, beseech (beg) you…to persuade all people of whatever rank, foot-soldiers and knights, poor and rich, to carry aid promptly to those Christians and to destroy that vile race from the lands of our friends…Christ commands it! All who die on the way (going to the Holy Land), whether by land or by sea, or in battle against the pagans (people who were not medieval Christians) shall have immediate remission of sins [will have their sins forgiven.]. Oh what a disgrace if such a despised race, which worships demons, should conquer a people which has the faith of God and is made glorious with the name of Christ! On the Fourth Crusade the Christians never made it to the “Holy Land.” They did, however, attack and conquer Constantinople – which was a Christian city on the way to Jerusalem. There was so much treasure heaped up in Constantinople, so many precious gold and silver vessels, cloth of gold and rich jewels, that it was a wonder to behold. Never since the beginning of the world has such wealth been won. 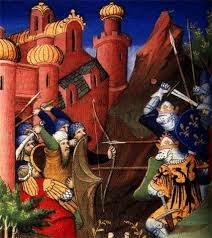 - Account of Robert of Clari, a French knight who witnessed the looting of Constantinople. Task 4 - Use the map below to do the following tasks on the map in your notes. 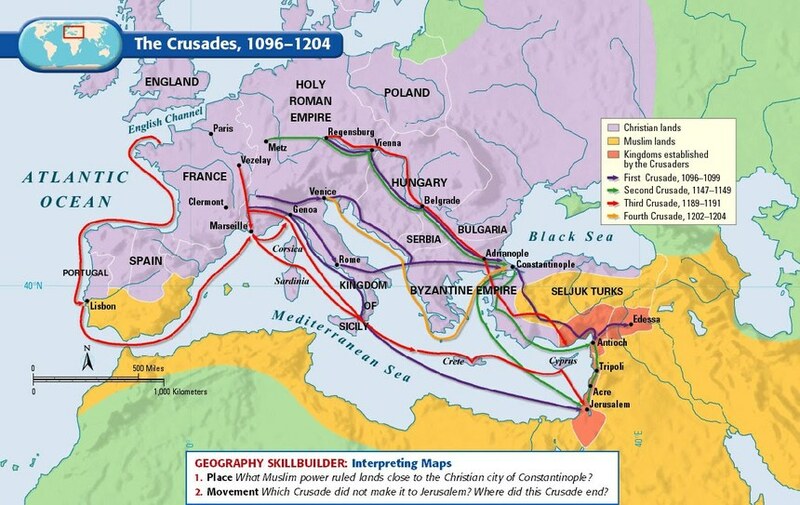 This map is ONLY showing 4 Crusades, there were more than this! 1. Color or outline the CHRISTIAN LANDS on your map purple. 2. Color or outline the MUSLIM LANDS on your map orange. ​FIRST - Read the paragraph below. The Crusades were a significant (important) event in world history. The events of the crusades impacted people at that time and in the future. When historians look at the past, they try to evaluate if the results of the Crusades were these positive or negative. But to do this they also have to decide which events or outcomes were the most important to world history and which were not as important. SECOND- Next, use the link to view a list many of the impacts/ effects Crusades on the world. Use this list to do the final activities on your notes sheet. Now go to Google Classroom to complete the Exit Ticket. You will need both your purple and yellow notes. 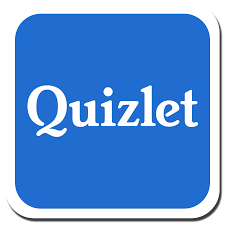 Use the quizlet set to study for the quiz on Wednesday covering the Power of the Catholic Church and the Crusades of the Middle Ages.